The KT-45 is yet another completely original design from the Doctor. The basis of this amp’s design is its EF-86 (preamp tube) front-end and Tone Stack also used on the Z28 and Route 66 models. The incredible timbre of the EF-86, along with gain that’s 50% higher than the hottest 12AX7, virtually inhales the tone straight through your guitar cord. 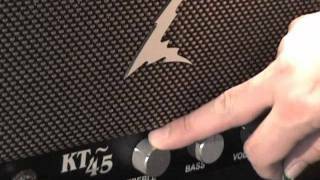 The KT-45’s tone stack allows control of the gain in three separate parameters- gain and amount of distortion in the treble registers, clear to swelling bass in the lower registers, and overall volume and drive. This allows you to dial in a Thick Top End, with a clean punching bass, or a swelling bottom end with crystalline highs. This is all done with plenty of clean to satisfy a Country picker, enough crunch for Rock & Roll, and tough singing sustain for R&B (British R&B that is!). Sonically the KT-45 captures the rich tones of the WHO’s “Live at Leeds” LP. It combines powerful driving distorted tones with a touch of defined articulation. VOX AC-30/4 meets HiWatt. Please check back for new review postings.